We’d love your help. 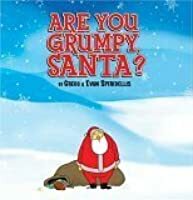 Let us know what’s wrong with this preview of Are You Grumpy, Santa? by Gregg Spiridellis. 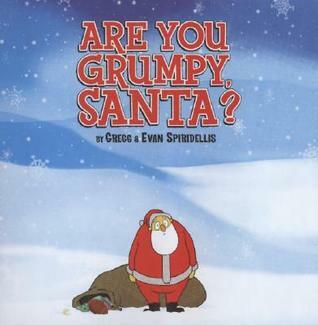 To ask other readers questions about Are You Grumpy, Santa?, please sign up. Be the first to ask a question about Are You Grumpy, Santa? I bought this as part of a Christmas present for my 'reading buddy'. At the last minute before I wrapped it I decided to read it and i'm glad I did! Santa may always appear jolly but he has feelings too! And when his elves/slaves shrink his clothes, when his wife refuses to give him steak for breakfast and when he is chased by a tiny dog with crazy hair his frown turns upside down. Moral of the story? Santa might lose his cool at any time and you better have a plate of cookies to cheer him up! A great read for kids. I think I'll be reading this every day to the 5-year-old between now and Christmas. 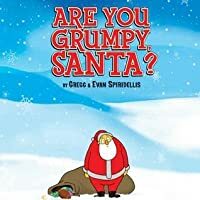 This is a super cute picture book showing that everyone, even Santa, can be grumpy sometimes. I've used it for story time and the kids loved it! So fun. Santa's grumpy & the illustrations that go along with the story are great for a laugh. My favorite is Santa being chased by a tiny, growling poodle in Paris. One of my Christmas favorites to read aloud. I have been trying to track this book down for years and it was worth the wait! Everybody has grumpy days -- even Santa -- but when someone does something nice/thoughtful for you, it can brighten your day. Very funny but not over my kids heads at all! I love that this book encourages leaving cookies for Santa...its something that we do every year! Even though my kids are older, we still love this book and set aside time to read it during the holiday season each year. This time of year everyone is short on patience and time. Even Santa can have a rough day at the office. This little book reminds us all to slow down and and enjoy the the things that are truly important. Humor is a necessity in everyone's life and kindness is one gift that fits all. A lot of humor in this story of Santa having a bad day, especially bits like Santa backing into a Christmas cactus or spraining his tush on a chimney, that I think will have the preschool crowd rolling in the aisles. Not pleased with the aesthetic of the illustrations, however (Mrs. Claus is absolutely terrifying). Even Santa can have a bad day. But there is one solution that will help his grumpiness go away. And we will make sure we do it at our house. My 3 year old loved this book! (we have read it over and over). Such a cute book. At the recommendation of a friend, I bought this book. It portrays Santa on a bad day, but resolves itself when a kind deed puts his life back in perspective. Now one of our favorite Christmas books. It's really funny and Santa gets really grumpy because he goes through all these bad things. For a twist on the traditional Santa tale, read about Santa's day all gone wrong. Don't worry--it has a happy ending! This book made me smile! I'm thankful mommy read it to me. Santa has a bad day too. See how is bad day gets better when he realizes that kids appreciate what he does. Clever, funny and it rhymes. Even Santa has some bad days. Sheesh! Santa's having the worst Christmas EVER! Luckily, he's about to discover that little gestures can make a very big difference. What happends when Santa has a terrible, horrible, no good, very bad, day. Eh. My 4-year-old liked it. An excellent read aloud selection! This is one of my favorite Christmas picture books. But, my little boy is happy to read it all year long. Love it! Fun, Christmas book with rhyming passages and a hilarious take on Santa.